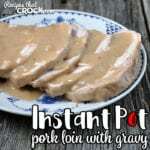 If you love a delicious pork loin with an amazing gravy, then you don’t want to miss this Instant Pot Pork Loin with Gravy recipe. Yummy! Place your pork loin in your 6-quart Instant Pot. Spoon your soup over your pork loin. Sprinkle your gravy mix evenly over everything. Pour your broth over the top of everything. Place your lid on top and seal it. Cook on the meat setting for 40 minutes. Remove your pork loin from your Instant Pot, place in a serving dish, give your gravy a good stir and pour over your pork loin in your serving dish. I doubled the Crock Pot Pork Loin with Gravy recipe for this recipe since 3.68 lbs was the smallest pork loin my store had. We love leftovers around here, so that works out great for us. If you don’t like leftovers, you can easily cut this recipe in half. The cooking time will be affected. I have not tried it, so I don’t want to tell you a specific time. I used chicken broth in this recipe (instead of water like I did in the crock pot version) and it was delicious!